Well, to be honest I'm wondering if the Bishops now have the muscle behind them to limit or even forbid Latin Masses, if they so desire. I'm also wondering if (like some are saying) they have the power to 'revise' Sacramental Rites....Baptism, Confirmation, Holy Orders etc, etc. Realizing that they must be 'approved' by the CDW, does anyone really think that the CDW as it now stands (with the Pope's dismantling of it in 2016)is going to 'deny' ANYTHING? Oh, but maybe they will if there might be some Bishops that want to swing the pendulum back toward tradition! The implications of this thing could be really disastrous. God help us!! It seems to be yet another attack from Bergoglio on tradition, and Tradition. Saddened, but not surprised. I guess he may think he cannot attack the Latin Mass directly, so why not undermine it any way he can? Of course, I should not really single him out in this effort - he has plenty of collaborators. I agree - what planet is he on that Latin presents some sort of obstacle or barrier to people, given it is sparingly used, if at all? My guess is that this motu proprio is almost entirely a result of Pope Francis reflecting on his experiences celebrating Mass in various parts of the world - and not much else. Think about it - when the Holy Father visits a region where he is not well versed in the vernacular language, he says Mass in Latin. As an example, do you remember two years ago when he visited the Basilica of the National Shrine of the Immaculate Conception in Washington, D.C.? It was the same Mass in which he canonized Saint Juniperro Serra (something only a media-darling like Francis could have done without a massive manufactured backlash). All the main prayers of that Mass, including the liturgy of the Eucharist, were said by His Holiness in Latin. And the reason for that was simple: Francis doesn't know that many languages, and though he can speak a little English, he's not very comfortable with it. Whenever this happens, Francis reverts to saying the Mass in Latin. So imagine Francis traveling the globe and saying Mass in Latin almost everywhere he goes because of the language barrier. Millions flock to see him say Mass, but when Mass starts, hardly anyone in the sprawling crowd knows what it is he's saying. For the vast majority of them, they've never head this language. They don't recognize the prayers and they don't know the responses. It's disorienting for them. It was certainly disorienting for most American Catholics two years ago, so much so that The Atlantic actually ran an article about it. Now imagine His Holiness travels to a Spanish-speaking country and says Mass in Spanish there. Again, millions flock to see him say Mass, but this time they know exactly what he's saying. They know all the responses. They understand him perfectly. I suspect Pope Francis vastly prefers the latter scenario to the former. And I suspect that's almost entirely how he formed his impression that "the comprehension of the laity requires the further expansion of the vernacular in the Mass." It's all based on his personal experience and how the crowds react when he is able to say Mass in their native tongue versus how the crowds react when he says Mass in a language that (for most of them) they've never been exposed to in their entire lives. It's hard to make the point respectfully, but almost everything His Holiness does makes far more sense once you realize that Francis is actually a fairly dim, narrow-minded Argentinian Jesuit who views the world almost entirely through the lens of his own limited perspective. Divide and conquer. What is the most successful way all revolutionaries eventually gain power? Create chaos, make a mess, and constant changes, all of which Francis has expertly done. The purpose of Vatican II was to eventually destroy the Catholic faith, replace it with a world-wide religion of the worship of man, and thus prepare the way easily for the reign and rule of the Antichrist. From the minute Francis was "elected", he has tirelessly worked to ensure this future. He lives for confusion, chaos, and constant change as he is the ultimate Modernist. He has no faith but in their Revolution and he has carried out his role so far to perfection. The two pillars of Catholicism are the Holy Sacrifice of the Mass and the monarchical governmental structure of the Church. Both have essentially been destroyed, only particulars needed to be implemented to ensure their final destruction. Francis is seeing to it the complete destruction occurs through him. All this nonsense is just making it more likely that once I convince my wife, we will be jumping ship to attend the Traditional Latin Mass exclusively. What's that experience got to do with anything? It doesn't matter much whether the canon uses "chalice" or "cup," either way, Francis would have to say it in Latin while celebrating Mass in an English country. The translation doesn't affect his inability to speak the language, so "his experiences" are irrelevant in that sense. To the extent his experience is relevant, it's lingering resentment over his recommendations for the episcopate being ignored by Rome while he was merely archbishop of Buenos Aires, hence a desire to humiliate and reduce the Curia. Of course his appointments make clear exactly why Rome ignored him. Do it...I did, never a regret! Reading through the TLM, you see how way more beautiful the prayers are, come to appreciate the prayerful silence of the Low Mass. Going back to N.O. Mass after that is like getting a root canal, having to participate in watered down, protestantized Mass, being forced to listen to crappy VII hymns, constant noise. So, practically speaking :), where do we go from here? 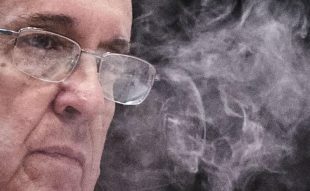 Are we to assume the reigning Pope Francis is slowing "undoing" what was done by the previous Pope? Are his motives evil? or just ignorant? In our times of extensive media coverage and constant, real-time updates about "this" and "that" happening at the Vatican, are we, as Catholic laity, culpable for our judgement of the Pope? That seems like a heavy burden for a mom of two young boys. Who am I to trust if I can't trust the authority of the Church? Mary, trust in the Church founded by Jesus Christ. The gates of hell will not prevail against Her. As you know, a primary distinction of Catholicism is belief in and submission to Magisterial authority, even if and when we doubt or disagree wiith it. The voices of opinion are just that. Do not let your heart be troubled. Stay true to the Catholic faith and continue to fight for the salvation of your family. ^Thank you. As St. Augustine said, "My heart is restless until I rest in Thee." But it's a good restlessness because it inspires reflection, conversation, action, and prayer. Other's opinions help stir my soul which would otherwise become stagnant, lacking movement or growth. I hope and pray that my mind is always challenged and, more importantly, that I never give up seeking the truth. Because of the nature of social media (blog comments included), the "face to face" quality of an opinion based debate is lost. That's why I like to put my face on my comments...so I don't forget that who I'm talking to is a person, not a soul-less computer screen. Don't worry about me. God has blessed me with an unshakable faith. I just like to participate in an online discussion from time to time (if I have the time in the morning before the boys wake up). It brings me back to the old college days when we were at least open to the idea of being convinced otherwise, verses today when no debates are ever won or lost on social media...the only desire of those participating is to get the final word and have the "drop the mic" experience. For the less known languages it will not change much. CDW does not have experts in all languages, therefore, they are simply not able to check the correctness of the translations. Google Translate is so far not adequate for doctrinal nuances of liturgical texts. So they would rely anyway on the assurances of the bishops conference that commisioned the translation that everything is alright. Apparently they did so in the past, too.